Derrick Lewis interacts with media during the UFC 230 ultimate media day at New York Marriott Marquis on November 1, 2018 in New York City. 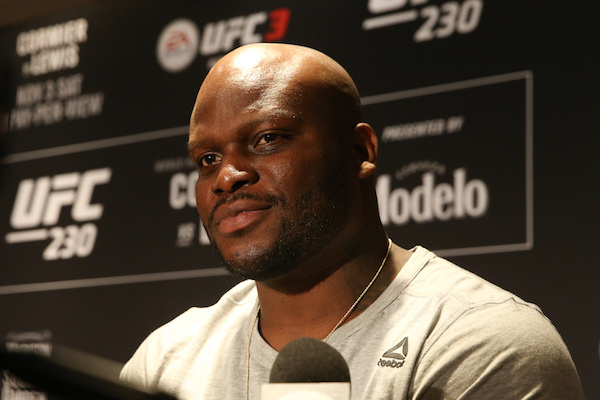 (Photo by Ed Mulholland/Zuffa LLC via Getty Images" align="center" />Derrick Lewis tried to keep a straight face when asked why the UFC approached him to fight for Daniel Cormier’s heavyweight title in the main event of Saturday’s UFC 230 card at Madison Square Garden. One second, two seconds, and then the laugh came. It’s one of the reasons why the 33-year-old Texan has become a fan favorite not just among UFC fans, but to the general sports fans who have been introduced to “The Black Beast” through his post-fight interviews and his ever-growing Instagram account. Yet while striking when the iron is hot is a good strategy for the UFC to have implemented for this headliner in the Big Apple, it wouldn’t mean much is Lewis didn’t present a clear and present danger to the reign of Cormier. And with wins in nine of his last ten bouts, with seven of those victories coming by knockout, it’s clear that Lewis is dangerous on fight night. It’s not just talk from Lewis, and if anyone needed any convincing, just rewind to last month, when the Houston contender avoided a near-certain decision loss to Alexander Volkov with a late flurry in the third round that knocked out the Russian standout with 11 seconds left in the fight. When it was over, the crowd erupted and Lewis had cemented his place with the top contenders in the division. He was just glad he was done for the night. Then came his instant classic post-fight interview with Joe Rogan, and if you didn’t know who Lewis was before, you probably did after that performance. He did both after beating Volkov. What Lewis didn’t expect was a call to fight Cormier for the belt in less than a month’s time. But he took the fight, knowing that he already finished a full camp for Volkov and that he has the power to score the upset anytime from round one to five. And who knows, maybe by the time Saturday night turns into Sunday morning, we’ll have a new heavyweight champion, one who battled back from hardship and prison time to become an inspirational figure in the sport. Now that will be some post-fight interview. “Winning the heavyweight title to me would be really good for people who were in my situation to see that life is not over,” said Lewis.